Football Season is Coming! Football Season is Coming! 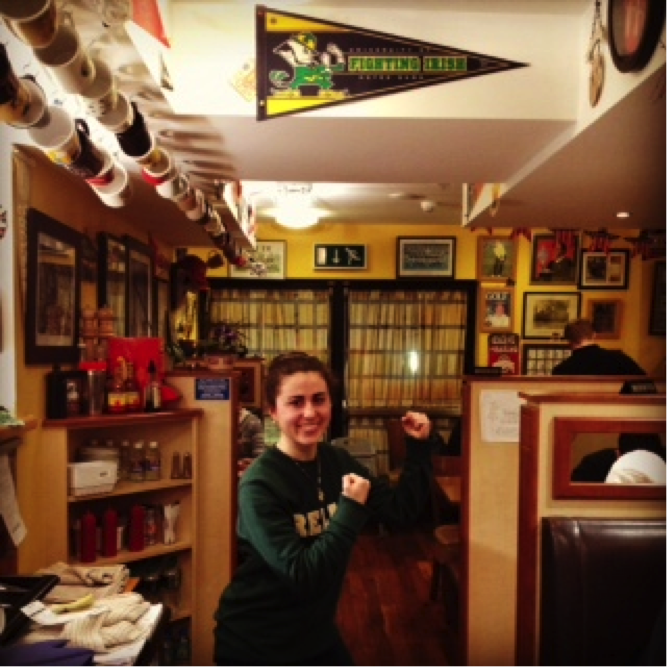 A Fighting Irish pennant at Scotty’s Steakhouse on a trip out west to Galway. Sitting on the 39a bus Monday morning, listening to Mumford & Sons, and attempting to read my book without getting nauseated, I look out the window at the streets that have become familiar to me. I no longer wonder what’s down Baggot Street or where Leeson Street might lead because I’ve walked the city streets now. With the sun streaming through the front of the bus (a welcome surprise after drenching rain and blustery mornings), I find that I still miss home, but it’s a little easier when family and friends are deep in snow and facing another 0-degree day. I decide to hop off the bus early and grab a free copy of the Metro Herald to catch up on the Irish sports and to work on a Sudoku puzzle. Standing in line at Coffee 2 Go, I contemplate Which one should I buy today? Do I dare try something new? Nah, I think. It’s a chocolate morning. 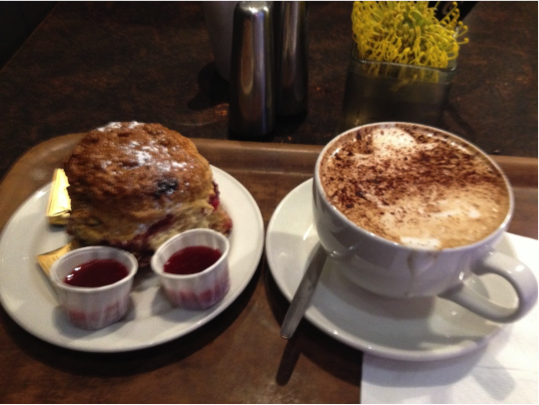 “I’ll have a Nutella scone and a cappuccino,” I say to the cashier who stamps my frequent buyer card. When did I become a regular? 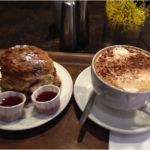 A scone and cappuccino from Keogh’s Café. And even in a big city, I have been able to make it feel small by losing myself in a long run in Phoenix Park and realizing how fortunate I am to be here. Having the opportunity to study abroad for the second time is a blessing. Being a part of the Notre Dame family has never been more apparent than when I’ve been abroad and felt the presence of so many friends, new and old, who have stayed in contact and made my time here memorable. I’m not only learning more about my chosen fields of biotechnology, pharmaceuticals, and business, but I also have had the time to really think about what I want to do when I come back to the states. Living in Dublin has made me understand how a city can transform you and can make you see the beauty in the little things. I’m looking forward to seeing where I end up after this program and to enjoying what is in store for the next few months. St. Patrick’s Day is just around the corner and the festivities will sure be good craic. 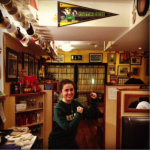 Love thee Notre Dame and Go Irish!